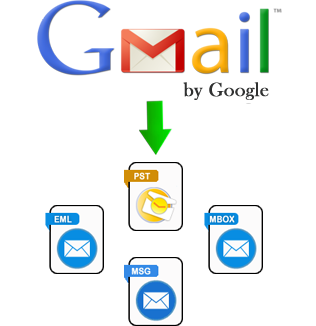 How to export email from Gmail to EML, PST, MSG or MBOX has become the most enquired query by the users owing to the Gmail outages in the past times. Our Gmail Backup software is a prominent solution that helps users to make backup of Gmail emails, contacts & calendars with utter ease and preciseness. The software is developed with the finest techniques at the backend the renders way to backup Gmail data that can be accessed in Outlook, Outlook Express, Windows Live Mail or other email applications supportive to PST, MBOX, MSG or EML file format. With this intellectually developed solution to backup Gmail data, users get a medium to work around issues that leads to delays in accessibility over emails and related data. Why Gmail Backup Is The Need Of Hour? For many users, Gmail to Outlook PST, MSG, MBOX or EML backup acts a mode that allows them to open and read emails without internet connectivity. And for some it acts a medium to safeguard the emails, contacts and calendars from consequences of Gmail outages. For Example : In 2009, Gmail underwent an outage where numerous users lost their mailbox data. Many users found their account completely reset. This is when the idea of creating backup of Gmail came into demand but the problem was how to export email from Gmail to EML, PST, MSG, MBOX. Introduction to solution like our Gmail backup tool helped users to create backup of crucial Gmail mailbox items with opportunity to access them in EML, PST, MSG, MBOX supportive applications. Users can analyze the ability of our solution to make backup of Gmail if Gmail email by downloading its trial edition that allows creating backup of 100 email items per folder from Gmail. If satisfied with software performance, investment in complete version can be made.